In the drive to decarbonise Europe's transport sector, fuel cell electric vehicles (FCEVs) offer crucial benefits. For one, their fuel – hydrogen – can be generated from a wide variety of local renewable energy sources, limiting reliance on energy imports. The FCEVs themselves produce no harmful exhaust emissions when driven, which has a positive impact on the environment and human health. Equally important, a growing hydrogen-based transport sector means new businesses and jobs for Europe. It's with the aim of increasing the presence of this eco-friendly technology on Europe's roads that the project H2ME was launched in 2015, followed by H2ME 2 less than a year later. Supported with EU funding, the two projects together form the most ambitious coordinated hydrogen deployment endeavour attempted in Europe. The projects' focus is on advancing hydrogen mobility in Denmark, France, Germany, Iceland, the Netherlands, Norway, Sweden and the United Kingdom. 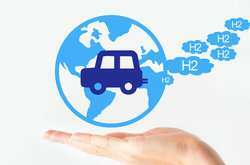 To do so, it plans to expand the European hydrogen vehicle fleet and establish a network of hydrogen filling stations in these countries. So far, 77 public hydrogen filling stations have been opened in some of the target countries, and a further 47 are in progress. Of the filling stations already in operation, 51 are located in Germany. Another 100 will open in 7 German metropolitan areas and along motorways by 2019. As FCEV numbers increase, another 300 hydrogen filling stations are to follow. "The hydrogen service station network is growing rapidly," said Chief Executive Officer Nikolas Iwan of German project partner H2 MOBILITY in an article posted on the 'NGV Global News' website. "Every two weeks we are opening a new station; the number of green dots on our map at www.h2.live will be growing fast over the next few months." Fuelling stations are equipped with 700-bar pumps for cars, with some stations also fitted with 350-bar dispensers for bus refuelling. Refuelling times range from three to five minutes. The planned hydrogen filling station network is an essential step in the journey to increase FCEV numbers on Europe's roads. To this end, the project aims to deploy 500 new FCEVs and 900 fuel cell vehicle (range-extended electric) vans by 2022. What sets FCEVs apart from conventional cars is that they produce zero harmful exhaust emissions when driven. They're also much quieter, since fuel cells don't rely on combustion and have few moving parts. Additionally, FCEVs produce less carbon emissions than diesel engines, even when the hydrogen they use is generated from a non-renewable source like natural gas. However, when the hydrogen is produced from low-carbon sources, carbon emissions are completely eliminated. According to the H2ME website, FCEV drivers can look forward to "a smoother, quieter and more responsive driving experience" when compared with cars running on petrol or diesel. The FCEVs being prepared under the project can typically drive between 386 and 700 km on a full tank, a range comparable to their conventional counterparts. The achievements of H2ME (Hydrogen Mobility Europe) and H2ME 2 (Hydrogen Mobility Europe 2) will also benefit observer countries Belgium, Luxembourg and Austria. The countries will use what they learn from this project to develop their own hydrogen mobility strategies. Will hydrogen-powered cars gradually become mainstream in Europe?